In August of 2018 we received a large collection of photographs from Kathleen LaCombe. The note on top of one pile said simply “Armbruster” and another, “Herfort.” How does one deal with a collection so large, that if stacked, would be as tall as my desk? How does one make sense of two families, without knowing either one? The job of a Curator is to take these family treasures and find meaning in them; to determine where objects, photographs, and papers fit into the story of our community, and to convey that to generations to come. We carefully record each observation and scrap of information about our objects, hoping that someday, our records will shed light on that one question burning in the mind of a visitor researching a passion of their own. My goal is to facilitate a personal little victory celebration for someone far in the future. I began sorting. There were several generations here, but two began to emerge as primary; an older couple, and that of a young boy. His pictures were scattered throughout the collection; as an infant, youngster, child, and one from High school. Looking past the smiling boy, I noticed a camper in the background of first one, then a second, then in several images laid out on my table. It wasn’t just any camper, it had character. It was possibly homemade, unique in its construction and character. Then there was the older couple. This couple traveled and were photographed at roadsides beside their car, in boats, at Yellowstone and in campsites. 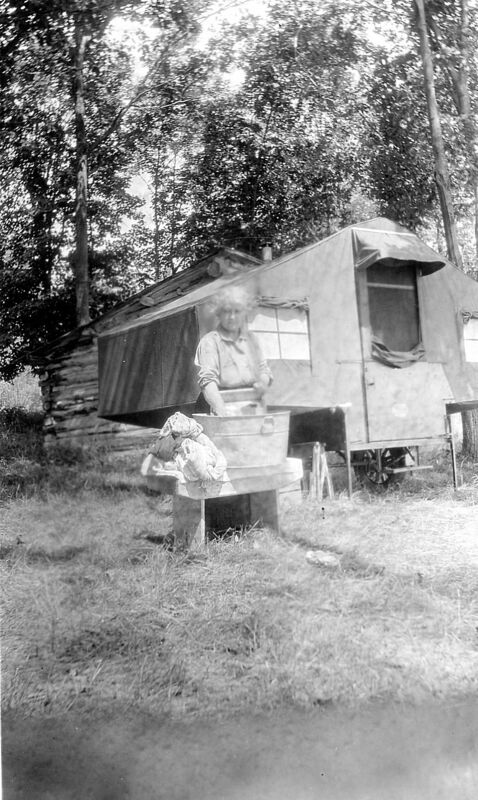 Finally, several photographs in front of that very camper related The Older couple and Young Boy. I placed the piles beside each other; a first and third generation linked. But the rest? I found images of a woman, smiling in the park, that matched other images of a woman with the boy, and those generations were linked. And finally, after more sorting, I found the boy’s name. I had found the Herforts. With the collection now sorted, I began to catalog, first those images of the boy, then his mother, then the older couple. With a collection too large to fit on my desk, I worked with groups of ten, first scanning the images, then numbering them on the back side, then linking the scanned image to computer the record where I wrote my observations. Towards the end, I was comparing several copies of a photograph. It was the older man, standing proudly beside his automobile, printed five times in three sizes. There, on the back of one, I found his name.